Hi, I'd like to show you this page I found on Furniture Discount Warehouse TM's website. The Occasional Group 2 Drawer Sofa Table with Shelf by Coaster at Furniture Discount Warehouse TM in the Crystal Lake, Cary, Algonquin area. Product availability may vary. Contact us for the most current availability on this product. Storage Two drawers. Lower shelf. This occasional group is the perfect set for any traditional living room. 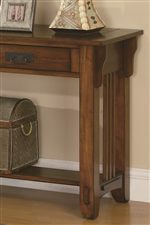 Crafted with a warm brown oak finish, it livens up a room with its presence. The most stunning design aspect includes the butterfly knot inlays on the table top. Drawer and storage shelves provide space for home accents and accessories. The Occasional Group collection is a great option if you are looking for Mission furniture in the Crystal Lake, Cary, Algonquin area. Browse other items in the Occasional Group collection from Furniture Discount Warehouse TM in the Crystal Lake, Cary, Algonquin area.